On average, a major winter storm hits some part of Meemic’s membership coverage area at least once per month between October and April. That makes for a lot of scary weather, and it raises lots of questions. 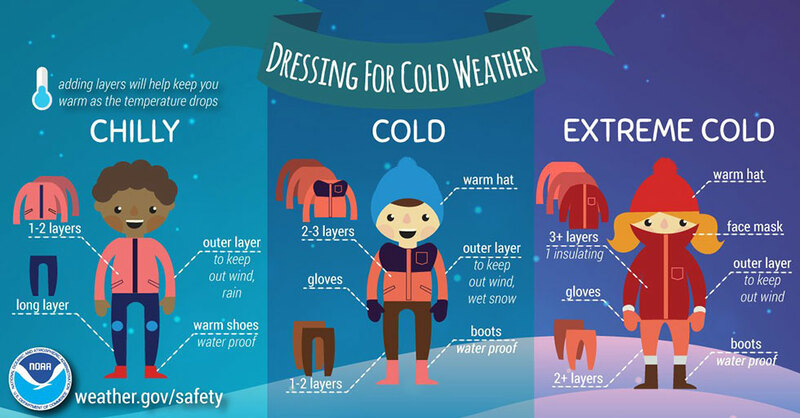 From the difference between advisories, watches and warnings, to the symptoms of hypothermia, to the perils of ice storms, we try to answer them below. The wind chill temperature is how cold people and animals feel when outside exposed to cold air and wind. Wind makes it feel much colder, and when combined with cold can result in frostbite and hypothermia faster than if there was no wind. More information, including a Wind Chill Temperature Chart and Times to Frostbite from exposure to cold and wind can be found at: http://www.nws.noaa.gov/om/winter/windchill.shtml. What is frostbite and what can you do to treat it? Frostbite is when your body tissue freezes. The most susceptible parts of the body are fingers, toes, ear lobes, tips of the nose and eyes. Symptoms include a loss of feeling in extremities and a white or pale appearance. To treat frostbite: Slowly rewarm the area and seek medical attention immediately. Do NOT rub the area, apply snow or plunge the affected area into very hot or cold water. What is hypothermia and what are the warning signs? Hypothermia occurs when the body temperature drops to 95 degrees Fahrenheit or lower and develops whenever body heat loss exceeds body heat gain. Hypothermia is often mistaken for fatigue, irritability or irritability. Warning signs include uncontrollable shivering, memory loss, disorientation, incoherence, slurred speech, drowsiness and exhaustion. How do you treat hypothermia? • Get medical attention immediately! • Begin warming the body slowly. Warm the body core first, NOT the extremities. • Prevent further heat loss. Get the person into a warm area and into dry clothing. • Wrap the person in a warm blanket covering the head and neck. • Do NOT give the person alcohol, drugs, coffee or any HOT beverage. • Give the person WARM broth and food. What is an ice storm? An ice storm is a prolonged period of rain that freezes when it hits the ground, leaving a significant coating of ice on trees, power lines, buildings, roads, walkways, etc. An ice storm with ice accumulation that is more than 1 inch thick can paralyze a region for days to a week or more. Ice storms can bring down trees, topple utility poles and communication towers, and can disrupt communications, power and travel for days or weeks. If an ice storm is in the forecast, be sure to stock up on at least 72 hours of food, water, medicine and other life-critical supplies. What do the various winter weather advisories, watches and warnings mean? The National Weather Service issues advisories, watches and warnings individually or for a combination of any of the following: snow, blowing snow, freezing rain, sleet and dangerous wind chills. Advisories: Advisories are issued when inconvenient winter weather is expected that will pose some threat to life and property. Advisories are typically issued when mostly travel impacts and some school/business closures are expected, though some power outages and road closures may occur. Advisories are typically issued 12 to 48 hours before hazardous weather begins. Watches: Watches are issued when life-threatening, dangerous winter weather is possible, but not yet expected. Watches are commonly issued ahead of warnings and provide advance notice on the potential for dangerous winter weather that may result in life-threatening conditions and major disruption to daily life for days to weeks. Typical impacts may include: extremely dangerous or impossible travel, lengthy power outages and widespread school/business/road closures. Watches are typically issued 24 to 72 hours before hazardous weather would begin. Warnings: Warnings are issued when life-threatening, dangerous winter weather is imminent or expected to occur. Warnings are issued when life and property will be greatly threatened, when major disruption to daily life is expected to occur and life may not return to normal for days to weeks. Typical Impacts expected include: extremely dangerous or impossible travel, widespread lengthy power outages and widespread school/business/road closures. Winter warnings include winter storm warnings, ice storm warnings and blizzard warnings, and are typically issued 12 to 48 hours before hazardous weather would begin. What is lake effect snow? Lake effect snow occurs when cold air passes over a large warmer lake, such as one of the Great Lakes. The warmer lake and cold air creates an unstable atmosphere. The air streams over the warmer lake and picks up some of the moisture and heat from the Great Lakes. In combination with unstable air, it creates snow showers. Those snow showers move with the wind into areas downstream of the Great Lakes. Lake effect snow can create a local, intense and narrow band of moderate to heavy snow that can extend inland as far east as across the entire Lower Peninsula. Lake effect snow may also be accompanied by strong, gusty winds and possibly lightning. Snowfall rates in the most intense lake effect events can reach 3 to 5 inches per hour! Areas that are most susceptible to lake effect snows are northern upper Michigan, western lower Michigan and northeastern Illinois. What are the various winter weather warnings and advisories? • A winter storm watch indicates severe winter weather conditions may affect your area in the next 12 to 48 hours. • A winter storm warning indicates severe winter conditions are imminent. There are a variety of warnings including, ice storm warning, lake effect snow warning and winter storm warning. • A winter storm warning for heavy snow generally indicates snowfalls of at least 8 inches. • Blizzard warnings are issued when sustained wind speeds or frequent gusts of at least 35 miles per hour are accompanied by considerable falling and/or blowing snow, for a period of at least three hours. Visibility is greatly reduced to near zero during a blizzard. • Winter weather advisories are issued when snowfalls are expected to be hazardous, but less than warning criteria. Source: Michigan Committee for Severe Weather Awareness, www.mcswa.com.